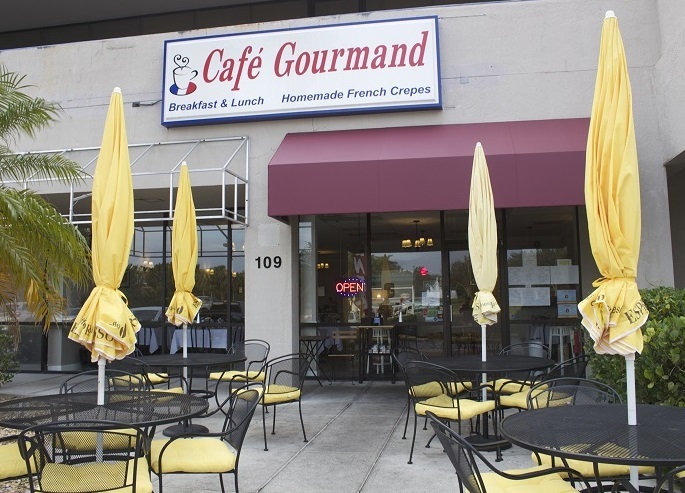 Cafe Gourmand is your french neighborhood restaurant. We’re proud to provide our guests with freshly baked croissants, breakfast sandwiches, coffee, catering and so much more. Stop on in. We’ll have delicious crepes and cup of coffee ready for you ! Authentic French Crepes: Homemade with Organic unbleached white Flour, Organic Eggs and whole Milk. French Baguette with Choice of 2 Preserves « Bonne Maman » and Butter or 1 Preserve « Bonne Maman », Butter and Nutella. Mimosa and Bloody Mary NOW AVAILABLE ! * Consumer advisory: Consuming raw or undercooked meat, egg, poultry or seafood increases your risk of contracting foodborne illness – especially if you have certain medical conditions. Section 3-603.11 EDA Food Code. It’s our intent to bring the best of France and Italy to all of our customers daily. We use the best ingredients to create our croque-monsieurs, croque-madames, quiches lorraine, our salads and our french sandwiches. Don’t forget we do Sweet Crepes and Savory Crepes too! Whole Quiche TO GO Available ! Chicken, Celery, Grapes, Pecans. Mayo and Celery Seed on Greens. All our Egg Dishes are made with Organic Eggs. A comfortable room, an elegant table setting, a customized dinner menu with french-class wines, and a dedicated staff providing gracious, anticipatory service. That is the French touch of our restaurant, and precisely what you can expect at Cafe Gourmand. Your event, whether it’s an intimate party, an outing with friends or a business meeting, will be as effortless as it is memorable. Only thursday to saturday ! The list below includes Wines by the Bottle, Specialty Cocktails, Wines by the Glass, Beers, Coffees and Teas & Spirits. While we do attempt to keep our menus up to date, prices and availability are subject to change without notice. * Consumer advisory: Drinking alcohol and consuming raw or undercooked meat, egg, poultry or seafood increases your risk of contracting foodborne illness – especially if you have certain medical conditions. Section 3-603.11 EDA Food Code.